Yes please, Do my Laundry for me! It's the new year and with the new year comes all sorts of new activities, crazy fun schedules and daily challenges with no extra time to fit them all into the day. Right at the end of the year our washer machine broke and it was not something we could replace so I've been taking loads and washing them and then coming home enjoying them but sometimes you just run out of time for that too especially when its not in one place. Around that time my kids were also battling that nasty flu that is going around and a few weeks later I myself got sick too. So when Dru from Green Clean Cleaners and I talked about her door-to-door laundry service the timing couldn't have been more perfect for me. I have never used a cleaning service or been to the cleaners aside from getting my pants hemmed once so this was a totally new experience for me and let me just tell you before I dive into the process how amazing it really was and I'm a first timer sold on this awesome service. So here's the scoop everything is so personalized with this family that owns this cleaners that we actually became instant friends because of the amazing customer service and just friendly personality that Dru and her family have. Green Clean Cleaners is located in Anaheim Hills and has a full service ability to do all cleaning and everything else that a cleaners should do. What makes them so special is their door to door delivery service and as a busy mom I can definitely appreciate that! Now that I think about it I definitely would have appreciated that back when I was working 12 hours a day as well...I've been on both sides. * Door to door is always serviced by the owners themselves. There will never be an outsourced stranger coming over to her your laundry. Actually, I watched Dru reply to a customer, that she locked the gate and gave their dog water too. That's customer service but better yet going the extra mile. * There is a $15 minimum and the cost per pound is $2.49. After searching, this was the cheapest rate too! * I found that it was most useful for us to have the kids clothes from the week of school and some of my daily yoga pants, yes I know and yes I live in them too, and also some of my husband's work shirts. * They have all types of laundry detergents from fragrance free to completely organic and everything in between....your choice at no extra cost to choose. * They will separate how ever you request at no extra charge. What I love about this, let's say a new mom needs all the bibs (I used to have 80 with my re-flux issue newborn) washed in a special detergent and the rest of laundry in another. That's perfectly doable and again at no extra charge. * The turn around time is fast and can be as fast as needed. I thought it was perfect for me to have laundry picked up late Friday and returned on Sunday. Works for freeing up some of my chores time on weekend and ready for week with laundry. While I sent out my basics I worked on my towels and jeans at home. Much less and much faster with the help of the delivery service on the rest. * They check in. Special texts or messages that ask how we like it, how the clothes are and just to say hello and thank you. I love this personal touch. * They give back to the community. By this I do not mean just their local needs and charities but also on a larger scale. Dru wants to build partnerships with all communities so that if there is a way to help on a larger scale they can and will. Right now Green Clean Cleaners partners with a Curtain company that donates scraps that she uses with her wire hangers to create wreaths for nursing and retirement homes. Their next project is to get the word out that they will be giving back on all levels. For example, Green Clean Cleaners wants to work with girl scout troops, schools and more on a give back level. They plan to donate a portion of proceeds by request... so if you use Green Clean Cleaners and want your give back to be for Troop #1234 of Irvine Girl Scouts, they will make that happen! Seriously, great job Dru! * In addition to the amazing customer service with a smile, our clothes felt soft, and smelled just beyond the fresh I get at home. Right now Green Clean Cleaners services Anaheim Hills to Irvine and even expanding down to Lake Forest area to Ladera Ranch. They are growing fast and I can now see from my personal experience why! 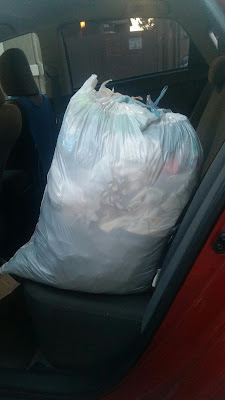 * Personalized customer service from door to door, just leave a trash bag full and it's return ready to be put away! * The options of all their detergents at no extra cost and that they will take your detergent if requested and use it. * Turn around time is amazing and flexible, if I was not able to be home and did not want my laundry sitting, Dru will always work out a schedule that works out for my comfort. * Follow up. There is not turn and burn here, each load and owner of the load is treated with the upmost service and respect. * The return of my clothes cleaner and fresher than ever. I am so happy I was able to give Dru and Green Clean Cleaners a try. I am sold and love the service and mindset of their goals overall. As a special thank you to my readers Green Clean Cleaners is giving me the go ahead to offer my readers 50% off on their first time in house dry cleaning services. This is for dry cleaning at their location! Just say OnTheGoOC and you get 50% off your first dry cleaning order. A special thanks to Dru for introducing me to some free time...hey I'll take 20 mins any day, it adds up! Green Clean Cleaners has a motto and I like it... "Our mission is to provide eco-friendly dry cleaning to OC at an affordable price with exceptional service." Get all the details and more on their website here and facebook here! I say your're doing a great job of that and I'll have another load ready for pick up!